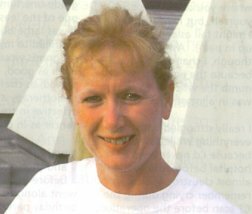 When her application to run the London Marathon was unsuccessful, Ann O’Donnell set about planning her own local route in South East London to raise money for Kidney Cancer UK. She completed the 26.2-mile course in just under 4 hours 26 minutes on April 13 - five years since she was diagnosed with kidney cancer. Her euphoria at crossing the finishing line was repeated later that month when she was given the all-clear at her annual check up, following "a scarey" 2002. Ann started running four years before she was diagnosed, and now the super-fit 45-year-old fits 40-minute lunchtime runs around her job in the City and role as joint coordinator for the South East branch of KCUK. Although she suffered several setbacks on her route to recovery, Ann just sought new directions before setting off again. Here is her inspirational story. "People say that life begins at 40 - and mine certainly did! I’d just got my life back, literally, after an operation to remove my left kidney and then I met my boyfriend Mark Dobson (Dobbo) who has been a wonderful emotional support throughout my recovery. In April I ran a marathon, which was a fantastic experience, and now at 45 I have just changed career, from being a PA to a job in marketing, with Lloyds of London. All this and I’m feeling absolutely fine and positive. But then I always have. I never had any painful symptoms, or felt ill. I’ve always been healthy and haven’t smoked since I was 23. So when I noticed some blood in my urine in December 1997, I didn’t think it was anything to worry about. It was strange, as my period wasn’t due, but it didn’t happen again until New Year’s Day. I was a bit concerned, but the next time it was all clear. I remember thinking that if it happened again I would have to get myself checked out. I know now why it never happened later the same day. The kidney tumour is invading blood vessels, and once the blood vessels are gone you empty your bladder and that’s it. The blood shows up in a urine test, but visually there’s nothing there. I didn’t mention it to my doctor, because I wasn’t happy at that surgery, but when I changed GP5, in February 1998, the blood showed up in my urine sample and I told the nurse about the two episodes I’d had. There are other reasons for blood in urine, including an infection or cystitis, so she sent the sample away to be tested. There was no infection, but because I’d had another show of blood before I went back to get the results she booked me in to see the GP. He didn’t think it was very serious, but still referred me to see a consultant urologist at Kings college Hospital. While waiting for the appointment, I was working late one day, and had gone to the toilet before going home, when I had an explosion of blood. It went everywhere and I was really concerned by now. Fortunately my boss was still around. I explained what had happened and asked if he’d wait with me, while I phoned my GP, in case I had to go to casualty. He was very good. I think he was more worried than I was! I was lucky to get through to my GP. I don’t know if he suspected then what was going on, but he said he didn’t think there would be any more bleeding that night and that I should go home. He faxed the consultant immediately to arrange an urgent appointment. I saw the urologist, Mr Mulvin, twice within the space of a week and he acted very quickly. He arranged for me to have a cystoscopy (a tiny camera is inserted into the bladder) first before an X-ray. It is normally X-ray first but, because Easter fell between when they could arrange both tests, if Mr Mulvin hadn’t done it that way round I would have had to wait two weeks before the cystoscopy - and he wasn’t happy about that. ’What do you mean,’ I mumbled. ’Well, it means you need an operation...’ he started to explain. ’Are we talking major surgery here?’I said fully awake now. ’We’ll talk about it when I see you.’ I was too stunned to ask anything else. There I was all alone at home and I’d just found out I had cancer. I think he did it that way because he couldn’t wait for me to have an appointment to break the news, and needed to get me in quickly after Easter, but I was very emotional and tearful all weekend. I went to see my dad, who had been diagnosed with cancer before me (colon in his case) and my stepmum (who later found out she had kidney cancer as well) and I was on the phone to friends the whole time. Being Easter weekend I was invited to a party, but left early because I was crying so much. I saw another friend during the week who was very caring, and bought me things to take into hospital. That was the kind of support I needed. I was admitted to hospital the following Sunday, so that they could do a ~T scan on Monday, and then on Tuesday 21 April my left kidney was removed and I was told the operation went very well. My brother really supported me that night, as he spent the evening by the phone even eating his dinner there - as he told all my friends how I was. I had to stay in hospital for 10 days to recover from the surgery, which was hard. The scar ran more than half-way across my abdomen. Before the operation I’d chosen to have an epidural to control the pain afterwards (the other choice was a pump where you could inject yourself, but I was frightened I might fall asleep and wake up in pain). After a day, though, I changed to that because the epidural didn’t numb the whole area so I was in a lot of pain. I really struggled with everything while I was there, because I’d never been in hospital before and found it almost claustrophobic. I remember crying during the ~T scan before the operation, because I was terrified. ’I know it’s a distressing time, but you need to put your emotions aside for the moment,’ the radiographer advised. The trouble with that is that it takes you a long time to pick them up again. It had all come as such a huge shock to me because I’d always been healthy. I’d been out running just days before the operation, and now here I was hardly able to stagger two beds down the ward! I’d had no preparation and struggled mentally with the physical side of it. I was only 39, but felt like an 80-year-old and couldn’t visualise being normal again. Kidney cancer is more common in men, but I was a fit young woman. I hadn’t smoked since my early 20s, although I was a heavy smoker then, but I think that stress and my family history played a part (there’s lots of cancer on my father’s side). My marriage broke up four years before I was diagnosed, and it took me a long time to get over it. Because kidney cancer is immune deficiency related, I would definitely say that my immune system was shot to pieces during that period. Ironically it was just after I wrote to my husband, in January 1998, saying he could have the divorce he wanted, that my health problems came to a head. When my 10 days in hospital were up I went to stay with my parents, in croydon, for a few weeks to convalesce before going home. At my first outpatient appointment Mr Mulvin told me I’d had a grade-one tumour, which is one of the least aggressive. It was large but had been confined to my kidney. My prognosis wouldn’t have been as good, if it had spread, as chemotherapy and radiotherapy are not as effective in treating kidney cancer as in other cancers. I had two months off work and then, two weeks before I was due to return, went along to a 40th birthday party and met Dobbo, and we’re still together. It was love at first sight, but we took it slowly. He’s been a tremendous emotional support to me throughout the last five traumatic years. I’d been back to see Mr Mulvin for my six-month check up, which was fine, and then wasn’t due to see him again until a year later but I panicked when my dad’s cancer had spread and saw him six months later. Because I’d brought my annual appointment forward, I didn’t keep my original one. I thought they’d call me in a year’s time, but they didn’t and I got lost in the system for a couple of years. I was going through a process of denial. Because I wasn’t contacted, I was able to pretend in my mind that I didn’t have to go so why think about it? I did try to stay healthy in that time, though, by swapping biscuits and junk food snacks for fruit and vegetables; and I also started taking selenium and vitamins A, c and E (although KcuK later advised against high doses of vitamin c). I also went to a support group during that time. I asked my GP and local hospice, but there was no information about kidney cancer. In the end I found a support group for all kinds of cancer, at charing cross Hospital, in Hammersmith, that I went along to once a month, until I saw KCtJK mentioned in some literature and contacted them. They were the ones who asked me when my next check-up was, and said I really must go back. I asked my GP for a referral in November 2001, but when I went back to Kings college Hospital in early 2002 Mr Mulvin was no longer there. I saw their doctor and was referred to a Harley Street oncologist, Dr Peter Harper, which was such a relief. I was very lucky to be able to see him. He listened and made notes and made me feel that he cared. He also saw the shadow on my lungs but the difference was the way he explained it. ’It’s great news, even though there is something there it’s so small it’s nothing to worry about. We’ll monitor it and if it starts to grow we’ll go in and remove it.’ I’d found a new route and I’ve stayed with Dr Harper ever since. That scare turned out to be a false alarm, as nothing showed up on my lungs during my next scan in September 2002, but there was a new scare to cope with. The CT scan showed something in the area where my kidney had been removed. It is quite common for a tumour to regrow there, and that was very worrying. I was booked in for a biopsy, but first they wanted to enhance the scan. They couldn’t get a vein, though, to inject the enhancer into, so the picture wasn’t great. In the end the radiographer didn’t do the biopsy because he said my lung was in the way and he wasn’t prepared to take the risk of puncturing it. He was also confident the tumour hadn’t regrown. As a result, Dr Harper gave me an appointment for three months time, for March 2003. The whole of 2002 was an awful year. I was on a rollercoaster of emotions, but between the two, what-turned-out-to-be, false alarms I decided to run the London Marathon. A girl at work was applying and every year I’d said I’d love to do it. This time, because I didn’t know what was going to happen to me, it hit home that there might not be many more times that I’d be able to sit there and say that so I said, ’Right, go and do it!’ Then when I had the next scare, and was one of the hundreds of runners who didn’t get in, I decided to do my own marathon to raise money for KCUK, as a thank you. Dobbo and I measured a 26.2-mile route, from my flat in Sydenham to Farnborough village and back, and after seven months of training I ran it on April 13- the same day as the London Marathon. My friend Alison cycled the whole route with me, to give me support and carry my water, and other runners joined me 10 and six miles from the end. I felt great until I came to a hill (one of many on the route) six miles from the end, which took all my energy. Then I hit that mythical wall with just two miles to go. One chap running with me basically talked me through those last two miles, which was just what I needed. When I turned the corner into my road, whooah what a welcome! Everyone was cheering and pulling party poppers over me. It was fantastic and one of the best days of my life. I’d hoped to raise 1,000 for KCUK, but money is still coming in and it stands at 6,220 at the moment! I organise a monthly South East meeting for the charity, with another lady. KCUK helped me through my scares. Sometimes you can get paralysed with fear and turning to people who are going through the same process as you, or are a bit further down the road, helps because they understand and can give you advice. KCUK gave me options that empowered me again, after that blas consultant made me feel that I had no control over my life. I went back to see Dr Harper a month later than I should have - my check-up was due in March but I wanted to run my marathon first - and lay down for the scan feeling really confident, for the first time, that everything was OK. I’d trained for a marathon, and run it. I felt that my body would have told me if something was wrong. So when he asked how I was I said, ’Terrific! And if you were to tell me otherwise, I’d be really surprised.’ He laughed and said ’You’re absolutely fine!’ and I kissed him because it was five years since I’d been diagnosed. I’m now back on annual check-ups and definitely feel that I’ve got over my cancer. I have been told I’ll need to have a colonoscopy by the time I’m 50, because of my father’s history, which was a bit sobering, but I know I feel really healthy so I don’t have any concerns at the moment. When people hear the word ’cancer’ they automatically fear the worst, but in my experience that’s not true. It isn’t a death sentence. I’ve always tried to remain positive. Kidney cancer is a disease that has an excellent prognosis if it’s caught early. Look at me, five years down the line and I’ve done a marathon! Before I was diagnosed I always looked ahead, but then I stopped planning because I couldn’t see a future. I’ve been through the break up of my marriage, an operation, my father dying, being made redundant - all major life-changing events. It’s just unfortunate they came together, but I’ve found that it’s all made me stronger. I thought, ’If I can get through all this, there isn’t much more life can throw at me that I can’t handle’. I’ve learnt to grab the moment. I don’t put things off any more. I’m planning a walking trip, following the Inca trail in Peru, I’m happy with my boyfriend, have just started a new job and will be doing a marketing certificate next year. So my life is well and truly back on course."